Welcome to the first stage of The Great Cardsmith Designer Search (GCDS)...the design challenge! This challenge is designed to test your nuts and bolts design skills, your knowledge of the color pie, and card balancing. Only the 8 Cardsmiths with the best submissions will move on to the top 8 and will participate in weekly single elimination challenges until a winner is crowned. Your task is to design 5 enemy color gold uncommon cards that could be printed in a generic standard legal set. 1) All 5 cards must be submitted as one post. Incomplete entries will not be judged. Entries can be edited until the judging deadline. 3) Each enemy color combination must be represented once on a single card (BG, UG, UR, RW, WB). 4) No double-sided or split cards will be accepted. 5) You must submit at least one of: Creature, Instant, Sorcery, Enchantment. Your fifth entry can be a second instance of any of these card types (your choice). Planeswalkers, Artifacts, and Lands will not be accepted. 6) All cards must be uncommon in rarity. 7) All cards must be made on or after October 6, 2018. No old cards will be accepted. 8) Only named evergreen mechanics or ability words can be used. No cards with custom or non-evergreen abilities will be accepted. me if they want to enter. Each individual card will earn a maximum of 20 points, so each submission will be graded out of 100 points. Each and every card of the top 8 scorers will get feedback and be graded on the following categories according to this holistic scale. Anyone is welcome to message me for feedback as well. 3 - Appropriate as an uncommon in a standard legal set. 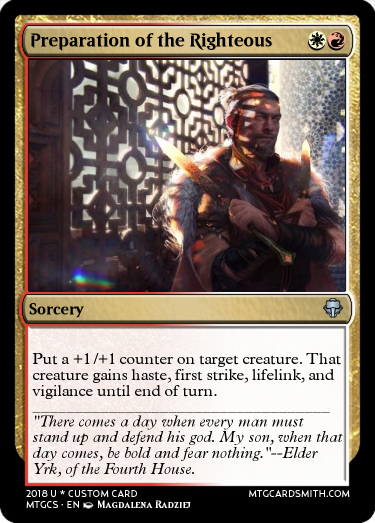 2 - Borderline as an uncommon in a standard legal set. 1 - Should be a common or rare in a standard legal set. 0 - Should be a mythic rare in a standard legal set. 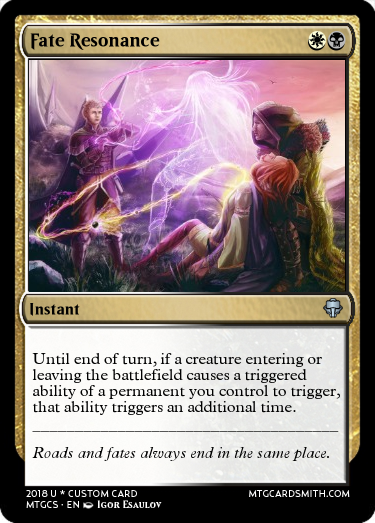 1 - Moderate flavor connection between card name and mechanics. 0 - Weak flavor connection between card name and mechanics. 3 - No spelling, grammar, templating, or magic phrasing errors. 2 - One spelling, grammar, templating, or magic phrasing error. 1 - Two to three spelling, grammar, templating, or magic phrasing errors. 0 - Four or more spelling, grammar, templating, or magic phrasing errors. 5 - Card is in color pie for both colors and could not be done in either monocolor. 4 - Card is in color pie for both colors but also could be done in either monocolor. 3 - Card is a borderline color pie bend. -Are there play pattern / repetition issues? -Does the card show novelty and/or creativity? -Does the card show a good fusion of the two colors? -Is it an appropriate power level for limited? Every entrant into this contest will receive one favorite of my choice on one of their entries into this contest. The Top scoring 8 Cardsmiths will advance to the next stage of the GCDS. As a reminder, the Grand Prize for the winner of the GCDS (the whole thing, not just this challenge) is 30 faves of their choice, 1 featured card, and 3 months of premium!!! This contest will close for judging on Saturday October 13th at 4:00 PM EST. No late entries will be accepted. Also, no "delay time" will be able to be used for this challenge. If you want to find out more about delay time, click on the link at the top of this listing. Attention all entrants!! This contest has now started so get your entries in!!! @bnew07, what do you mean by enemy color? I am still unclear on that. How will not having space for flavor affect things? Suggestion, I know it is probably a very small factor (and part of the least pertinent "flavor" category), but I think you should remove the art component from the judging. GDS obviously couldn't judge entrants on this anyway, but I don't think it makes sense for you to allow the art selection to sway you. Some of us are better at "choosing" art (or have bigger saved collections to choose from), but that isn't a component of card design, merely icing on the cake that will "stole" from someone else in the first place. *Sarcastically* Noooo! I was banking on art choice! Custom mechanics aren't allowed, but is custom lore allowed? Good suggestion. I will remove art choice from the flavor Criteria. 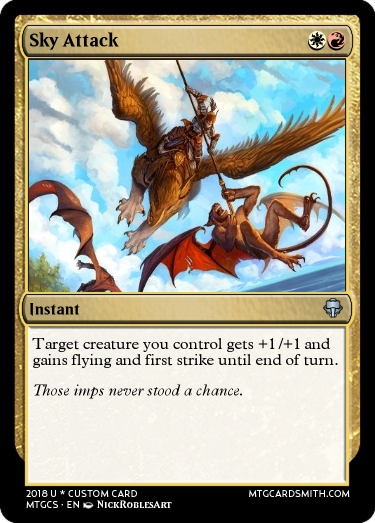 Flavor text is not required. The flavor connection is more about the mechanics matching the card name, flavor text is just extra so don't feel like you have to include or that not having it will affect your score. Correct, No custom mechanics, however you can use whatever lore/flavor you like as long as it is appropriate for a standard legal set made by WOTC. 1) I specified no joke cards in the entry criteria. 2) the winner of the entire contest will now also get 1 featured card from among their entries in the contest! @bnew07: are we supposed to make actual custom cards for this or are we supposed to present cards in a written format as was done in the actual GDS? 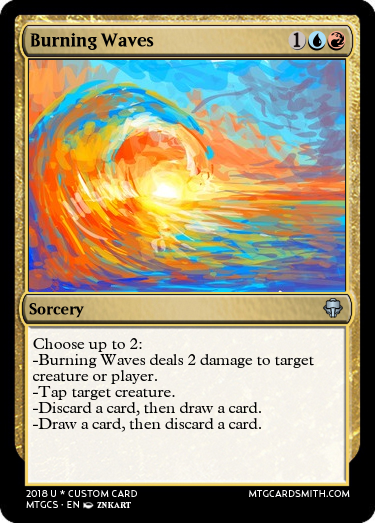 Fate Resonance is meant to synergise with various white and black value strategies such as blink, recursion from graveyard, tokens, and sacrifice. It is inspired by an old double-faced land I designed called Origin of the Spirit Trail//Denouement of the Spirit Trail. 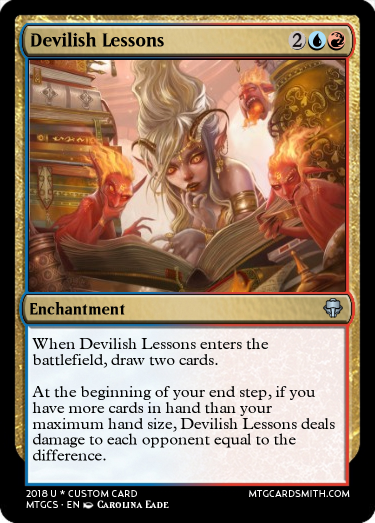 Devilish Lessons is meant to convert card advantage into a way of closing the game. It's actually similar in its spirit to cards like Sphinx's Tutelage. It is inspired by a not-so-old enchantment of mine called Midnight Cramming. 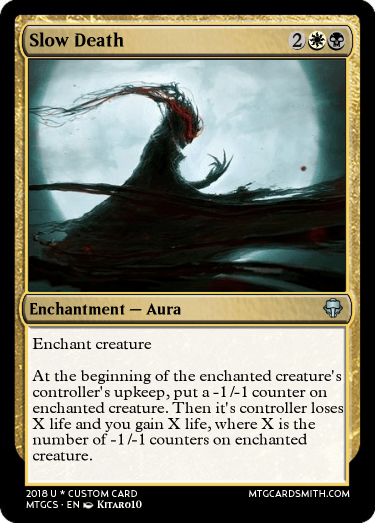 Ritual of Life and Decay is a utility spell that can get you either a slightly overcosted effect or slightly undercosted one depending on how good you can anticipate your opponent. 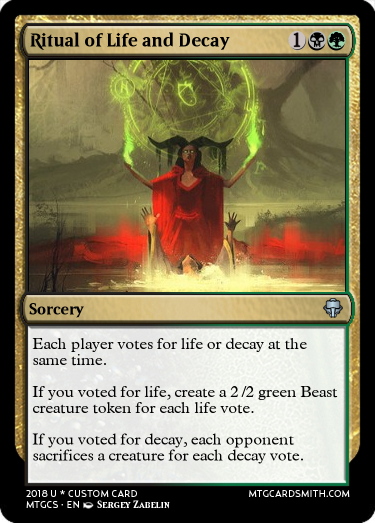 It uses my custom mechanic "Trust of the Council" (without the actual ability word on the card for the contest of course), here's an old example: Hoping for a Nightmare. Battle Cenobite is an agressive creature meant to synergise with various Boros strategies like pump spells, auras and equipments. It is inspired by my old card Chandra, Child of Ember. 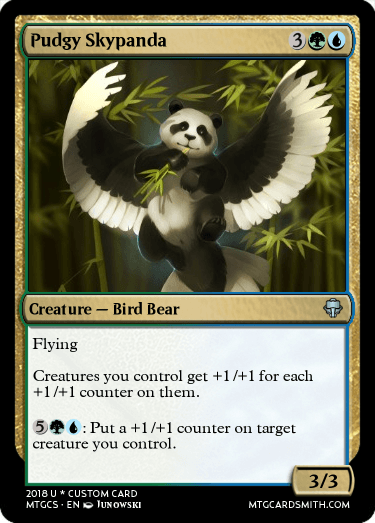 Pudgy Skypanda rewards Simic +1/+1 counters strategies by basically turning your +1/+1 counters into +2/+2 counters. It is inspired (loosely) by an old instant of mine: Unexpected Mutation. Sky Attack is a combat trick that combines a white-based mechanic (flying) with a red-based mechanic (first strike) to create something that will stop many things on the ground and in the air. Red and White both have many combat tricks, so it seemed right to create one for my White-Red entry. White-Black has always been a fan of draining life and killing creatures, and this one does both in one! The name ties to the fact that the creature is slowly dying, and the player is also. 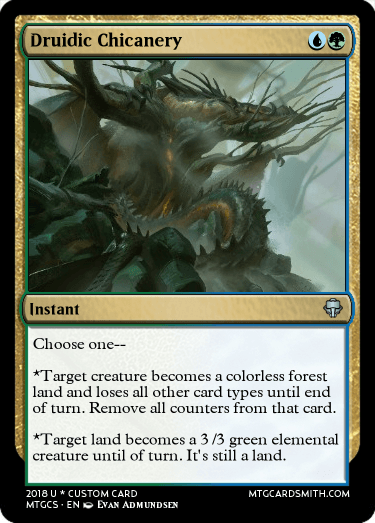 Black-Green is, has been, and always will be the color combo that cares most about the graveyard, and this card reflects that. It's kind of like a less OP Tarmogoyf, as it only counts the stuff in your graveyard. However, it does count all the stuff, not just creatures. Just make sure not to play this with no Instants, Sorceries, or Enchantments in your graveyard! 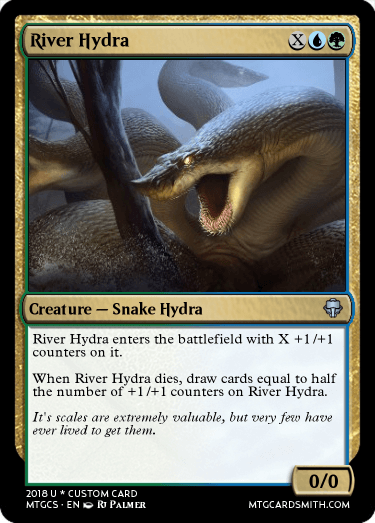 This is a very simple design based in my love for hydras, and the good feeling everyone gets, even people who hate blue, when you draw cards. I made it less OP by having it only be half the cards, but even then it's 4 mana for a 2/2 draw a card on death, which is not bad. And the more you spend on it, the better it gets. 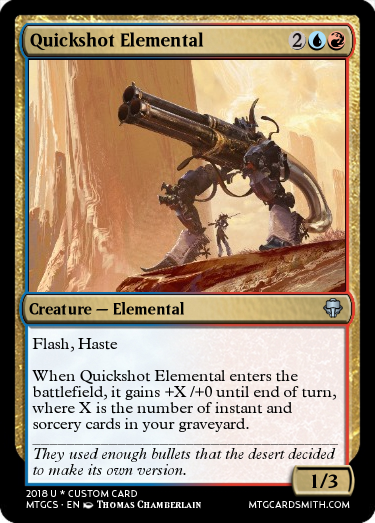 I decided to go with this modular spell for Blue-Red because I thought that it would be an interesting way to show this color combo. It does all kinds of things Blue-Red loves to do, from drawing cards to shocking things. It was originally going to cost only UR, but I thought better of it and upped the cost to 1UR. @bnew07, do former evergreens such as shroud count? "This permanent or player can’t be the target of spells or abilities." Great work so far, everyone! @aggroman15 I really want to cast my simic spell against yours. Also, Slow Death reminds me of One Thousand Lashes from Gatecrash and I dig it. It does have that reminiscence, doesn't it?